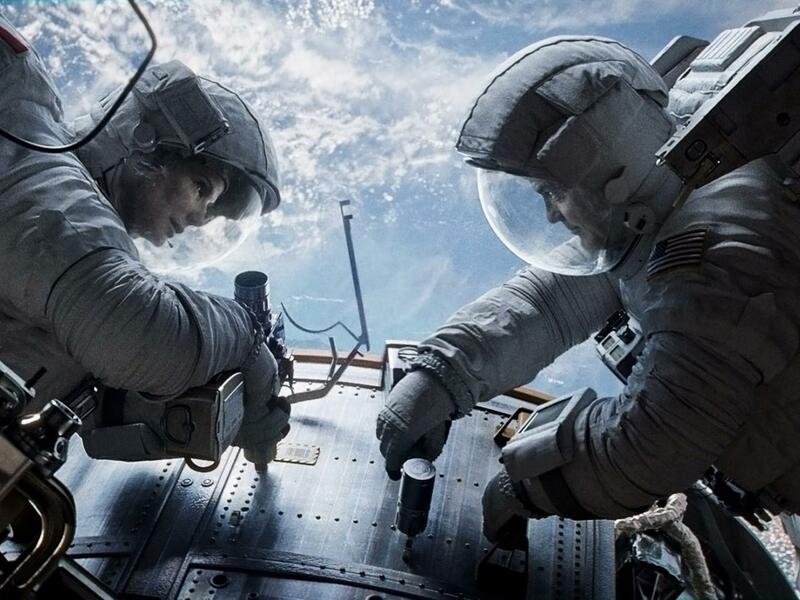 Sandra Bullock and George Clooney star in Director Alfonso Cuarón’s 'Gravity,' a story of astronauts stranded in space. Astronauts are an elite group. More people (way more) have gone on to become rock stars and reality television stars than have experienced true zero gravity while orbiting the Earth in the inhospitable environment of space. But as select as that group is, they can still get starstruck, which is how astronaut Catherine “Cady” Coleman felt when she found herself on the phone with actress Sandra Bullock in preparation for her role in Alfonso Cuarón’s Gravity. Coleman has logged more than 4,293 hours in space, and she was logging a few of them when she talked to Bullock, who was firmly planted on Earth while Coleman orbited roughly 220 miles above in the International Space Station. Many months later, in a bizarre reversal of roles, Coleman found herself firmly planted in a theater seat while Bullock orbited the Earth weightlessly in the film. Astronaut Mike Massimino is more accustomed to the spotlight than Coleman. During his two missions in the now defunct space shuttle, Massimino logged over 571 hours in space, 36 of which were spent spacewalking. His second mission became the focus of the IMAX film Hubble 3D, which documented the final service mission by the shuttle program to the Hubble Space Telescope. He also made headlines by being the first person to ever use Twitter from space. Massimino remains an active duty astronaut, but also appears as a frequent guest on programs like Neil deGrasse Tyson’s Startalk podcast, has co-hosted a National Geographic Channel show, and appeared as himself in four episodes of CBS’ The Big Bang Theory. Prior to the film’s premiere last week, we had the opportunity to speak with both Coleman and Massimino. They gave us an astronaut’s view of film, how accurate they felt it was, and whether or not space debris can be as catastrophic as it is in Gravity. 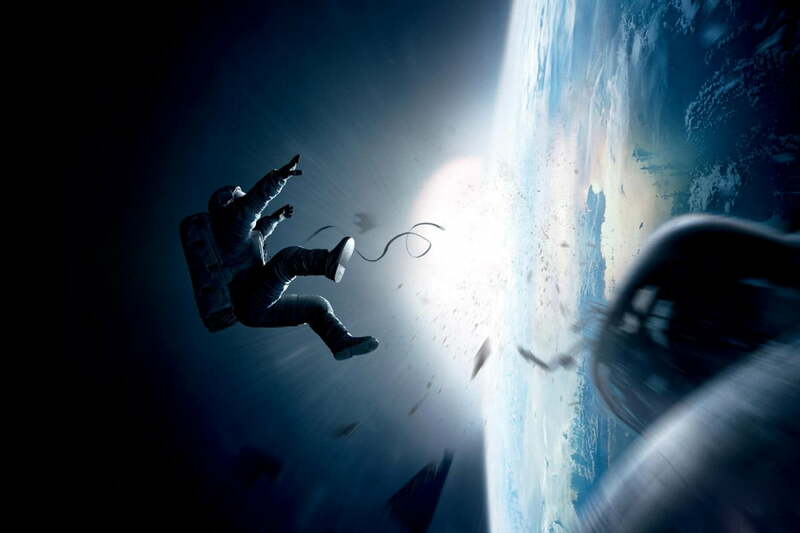 Space debris is a central element in the movie. Is it really a concern for astronauts? Massimino: On my flights on Hubble we were concerned about the risks of getting hit. I actually flew on Columbia, on the flight before we lost Columbia, I was a rookie on that flight. I remember our first meeting before when the spacewalkers got together before the mission, and the lead said “We’ve lost a crew on launch, and I think the next time it happens is going to be on a spacewalk, so let’s get together and make sure it doesn’t happen to us.” So we did whatever we could to make sure that when we buttoned someone up inside their spacesuit, they were ready to go. We knew the checklists and we went over every emergency, and we practiced and practiced and practiced. One of the things we were concerned about was a debris hit. When we looked at the Hubble while we were spacewalking on it, the high-gain antenna which is like a big dish actually had this big hole in it, about the size of a silver dollar. It was from a micrometeorite that was heading towards Earth and clipped it on the way in. We pulled out the wide-field camera which has an exposed radiator and brought it back down with us, and when I was checking it out at the Jet Propulsion Lab, it looked like some kid with a BB gun had got at it. It was just debris from space that had dinged and peppered it. So, we practiced rescuing a crew member who had been injured by a debris hit. These are real risks, and these are things we think about. 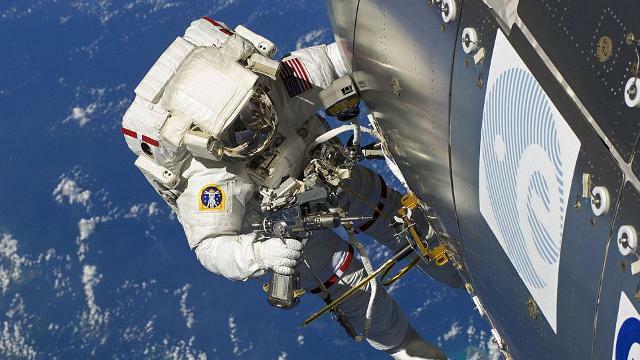 Astronaut Catherine “Cady” Coleman has spent 4,293 hours in space. Momentum is also very important throughout this film, because it seems like whichever direction you’re going to be moving, that’s the way you’re going to be going for awhile. How hard is it to get used to that? Massimino: You have to be careful. We rendezvoused with Hubble, and you’re building momentum in different directions, and you’re traveling at 17,500 miles per hour, 350 miles above the planet, and you have to hit this target. Plus you only have a limited amount of fuel aboard the shuttle, and you could run out of gas if you use too much movement and waste the fuel. Then we would feel really foolish, ‘Uh, sorry we wasted this launch, we have to come back and get more gas.’ So Scooter (astronaut Scott Altman) came up with this saying, ‘The longer we do nothing, the less we’ll have to do later.’ Which meant we would just drift for awhile and line everything up correctly. Massimino worked on the Hubble Space Telescope on both STS-109 and STS-125. For spacewalks, when we practice, I describe it as like playing in the World Series, or the Super Bowl, without ever practicing on the field. We can’t practice in space, so we practice in lots of different facilities, and the place we practice most of our movement is in the pool. We have this gigantic pool at the Johnson Space Center, it’s 200-feet long, 100-feet wide, 40-feet deep, it’s like a lake. It’s gigantic. You could fit a space station, and a shuttle, and a Hubble in there so we can practice our spacewalks. When you’re in the water, you practice this moving around. But what you have to be careful of in the water, physics-wise, is that you have water that dampens your motion. As you move along, you’re fighting the weight of your suit, and the water also dampens your motion. If you try to move the same way in space, you’re going to go for a ride because a little motion is going to take you a long way. Every spacewalk we do, for first-time spacewalkers, you get 15 minutes of what we call translation adaptation. We try and do a lot of practice inside the spaceship, but when you get out there, you have to move very, very carefully. One little push, and you can launch yourself. You do have a safety tether, but you don’t want to rely on that. I was confident in the safety tether, but I wasn’t so sure about my heart. They may get me back, but I’m not sure what’s gonna be on the other end of the line. There’s a scene in the movie when she’s tumbling and she sees Earth, space, Earth, space – that was one of my nightmares. I don’t ever want to see that. 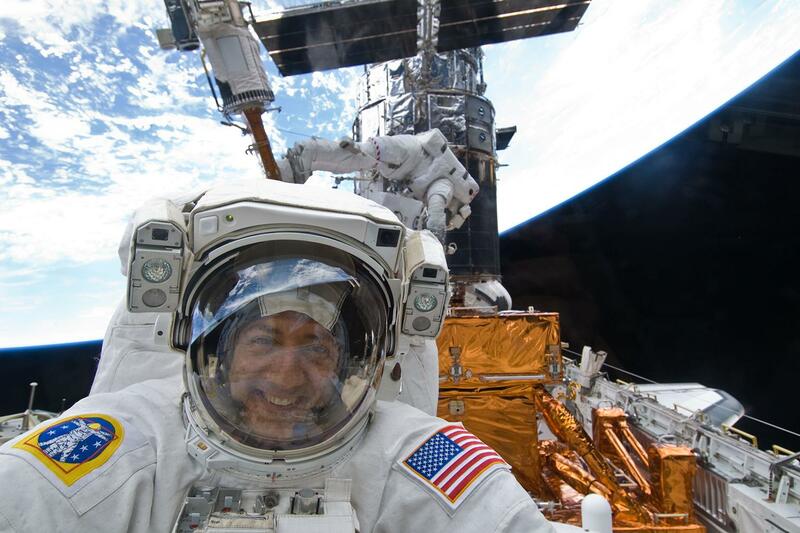 Astronaut Mike Massimino on one of his five space walks. Coleman: To give you an idea of how little it takes to move in space, and the example I gave Sandra, was that you could take a single hair and if I [tied it across] a handrail or something that was sticking out and just barely pushed … I could move myself across the entire module, or the length of the entire space station. And that’s just pushing against a single hair. I mean, if I did it hard, it would break the hair, but it takes so little to make it move. We used to have contests, because we’re all competitive, to see who could launch themselves off and see who could go the furthest without touching anything. Right before I left, we found the most amazing thing in the office supplies drawer. We found a rubber band that was twelve feet long! It was like a giant person slingshot. Unfortunately we were too busy to use it before I got off, but it truly is magic to be able to ‘fly’ from place to place up there. It is like living the life of Peter Pan. If I could have had my family up there, I would have never come home. In the film the astronauts lose contact with mission control but keep transmitting to them. 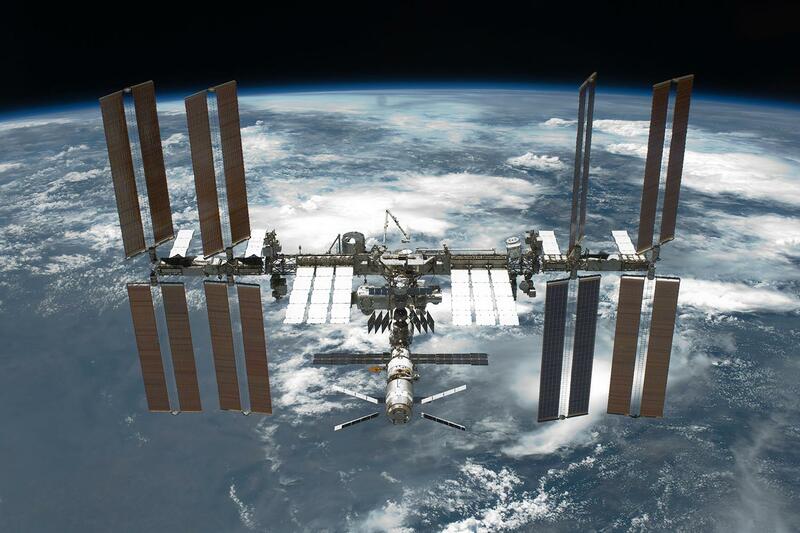 What ways do you have to communicate with each other in space when the radio doesn’t work? Massimino: We do use a lot of hand signals, like scuba divers do. We actually use fairly basic signals like ‘Can’t hear’ [waves hand over ears] or ‘Can’t talk’ [waves hand in front of mouth]. Actually, that happened to me on my third spacewalk. I was setting up the payload bay for me and [Mission Specialist on STS-125] Mike Good. I was setting everything up to make sure the coast was clear, because he was the new guy. We have these different comm switches on the chest piece of our spacesuit, and they are protected so you can’t bump them and accidentally turn them off. So, I’m out there setting up the tethers on the robot arm and something clipped one of those switches. We didn’t know it happened at the time, but all of the sudden I was like, ‘Hey… it’s gotten awful quiet.’ So then I’m talking, and I’m thinking that John [Grunsfeld, Mission Specialist and Payload Commander] usually responds to me right away, but maybe he’s busy. After awhile, I’m looking at him and he’s mouthing something to me and I can’t hear him. I can see him through the window, because I’m out in front of the shuttle by this point, but he can’t hear anything I’m saying and he hasn’t been hearing me for awhile. So apparently, it was already causing a panic with the ground, because it’s an abort situation if you can’t talk. So we just communicated with hand signals, and I looked down and one of my switches was out of place. So, I just popped it and then we were back in. So, we were really lucky, because they were already starting the procedures for a lost comm, which would have involved switching antennas and then we would have been out of sync, so it could have been a real problem. How accurate do you think Gravity is? Massimino: Well, to give you an idea, I remember thinking ‘Why is she on such a long tether when he was pulling her? !’ I never would have done that. We could probably go around for a couple of hours and give you an example of how astronauts watch this movie. I’m just impressed that Sandra Bullock went through a lot of the same training that we do. She was doing what we do in order to prepare for zero gravity and spacewalks.